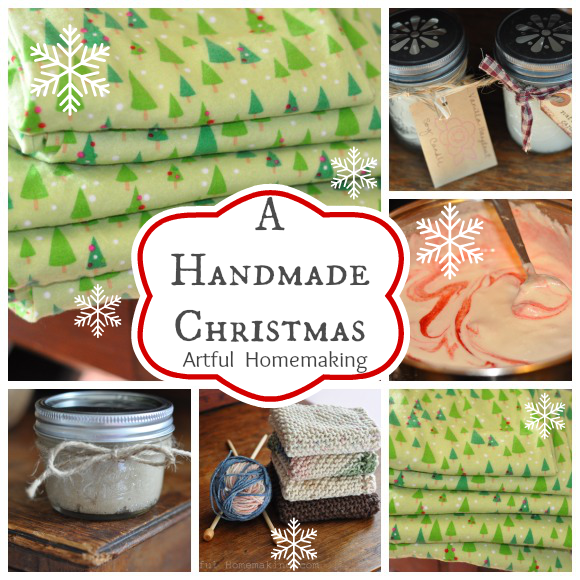 Handmade Christmas gift ideas, including soy candles, sugar scrub, and more! I love handmade gifts! They almost seem more special somehow. And I especially like it when the gifts are useful and not clutter-creating! Things like baked goods, soap, body scrubs and other handmade cosmetics and body products–all of these are useful and don’t create extra clutter. Every year I plan out a list of handmade gifts I’d like to make. I’m a bit behind this year (other than making some soap and vanilla), but I have a few other gifts I might try making if I have time. I thought it would be fun to share a few ideas I’ve used in the past and some that I hope to do in the future (maybe this year). And I regularly pin things to my Pinterest board, so I often go there for inspiration. 1. For the past couple of years I’ve made a tradition of matching pajamas for the kids. It’s so fun to see them all in the matching p.j. pants on Christmas Eve and Christmas morning! Then I usually just get them a solid-colored long sleeve t-shirt to go with the pants. And they’re super easy and fast to make! I found a great tutorial on Pinterest here. I’m not sure if they’ll be getting some this year because the fabric is so expensive. So, I’ll only be doing this if I can find some very inexpensive flannel. 2. Make some playdough. This is also easy to make, and you can dress it up by adding essential oils (I love peppermint for the winter!) and glitter. 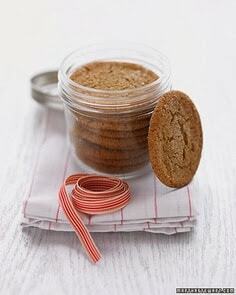 Package in small jars and give with some cutters. Kids can help make this for their friends, cousins, or siblings! 3. Dye your own playsilks. Playsilks are a favorite “toy” at our house, and they are very easy to dye with Kool-Aid (and cheaper than buying them). 4. Knit some dishcloths. Or, you can also give these as washcloths (maybe with some sugar scrub!). They’re a very quick knit, so you could easily start these now and finish them in time for Christmas. 5. Make some soy candles! These are really not that difficult to make, and most people love candles. 6. Homemade vanilla is such a lovely gift, but it’s a bit late to start it now. 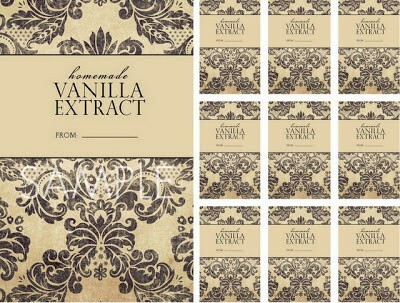 If you have some already made, I found some beautiful free printable labels to use on your jars. 7. Vanilla Brown Sugar Body Scrub is a another great gift to make. You can also add essential oils and other ingredients to vary the recipe. 8. 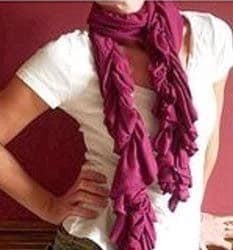 Scarves are easy to make and easy to wear. Size doesn’t matter! You can find tutorials all over the internet for these. 9. Baked goods and food can be a great and simple gift idea. 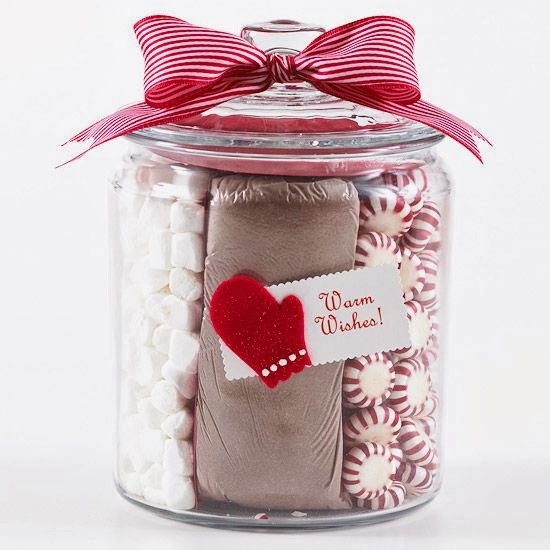 They look especially nice packaged in a cute jar or basket, which is then useful after the food is consumed. 10. 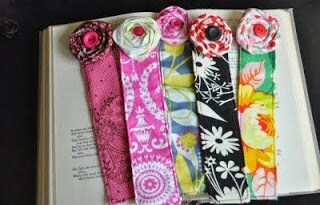 Bookmarks are always useful, and there are so many creative ideas for them! There are so many creative ideas out there! I’m still hoping I can find some flannel for those matching p.j.’s, and I have a puppet theater that I started but didn’t finish last year (due to getting the flu right around Christmas!). Do you have any other handmade Christmas ideas you would add to this list? Are you planning to make any of your gifts this year? On black Friday Joann' s always has flannel super cheap…they stock so much of it that I have gone in the afternoon even after it was picked over and still found tons I liked. I think it is usually like $2 a yard or so can't remember exactly. I stocked up like 2 years ago and still have some left. Love your blog! Thanks for mentioning that, Rachel! I wish we lived closer to one…our nearest store is about 2 hours away! I'm sad to miss such a good deal on fabric. 🙁 And thank you so much for your kind words about my blog! I don't think I've every commented here before, (but we follow each other on Pinterest- I'm Crabapple Pond) even though I visit often. Just wanted to suggest looking for flannel sheets to make p.j.s, plenty of fabric and often a good bit cheaper.